Lake Como is a lake of glacial origin in northern Italy, not far from the Swiss border, in the Lombardy region. In Italian, its name Lago di Como, but it is also known as Larío which is the Italianised version of its Latin name Larius. To avoid confusion with the city Como, the lake is normally not referred to simply as Como – you say Lake Como, Lago di Como or Larío. Lake Como and its surroundings has been an illustrious retreat spot for the members of rich and influential families since the Roman times, and continue to be so today. Back in the days, Pliny the Younger built the resorts Comedia and Tragedia here. Today, the lake is surrounded by large and beautiful villas with interesting histories. You don’t have to own a villa to vacation by Lake Como since there are plenty of hotels to chose among. Still, Lake Como has retained its air of exclusivity and it is certainly not the most affordable part of Italy to visit. As a tourist destination, Lake Como certainly has a lot of things going for it. The landscape is exquisite and the lake is great for boating, sailing and kite-surfing. From the surrounding farms, you can purchase locally produced cheese, honey, olive oils, eggs, salami, fruits, vegetables, and more. Many of the farms have their own little shops at the farmstead. Some of the lakeside villas have been partly turned into museums open to the public. One example is Villa Charlotta, which contains a museum of agricultural implements and several important works of sculpture. This villa was built for the Milanese Marquis Giorgio Clerici in 1690 on 17 acres of land facing the Bellagio peninsula. Another Lake Como villa well worth visiting is Villa del Balbianello, built in 1787 on the site of a Franciscan monastery. This was the final home of the explorer Guido Monzino and is today housing a museum devoted to his work. Villa del Balbianello is situated on a promontory of the western shore of Lake Como. Villa L’Oleandra: Villa L’Oleandra is a fabulous villa located near Laglio. George Cloney purchased Villa L’Oleandra in 2001. He was one of the first famous people to buy a Villa on the lake and he played a large role in making the lake as popular as it is today. Villa Fontanelle: Villa Fontanelle is located right on the water in Moltrasio. The villa was earlier home to Versace but was purchased by Arkady Novikov in 2008. He is said to have paid 52 million for the villa. Villa Fontanelle is sometimes referred to as Villa Versace. Arkady Novikov has made his fortune in the restaurant business and is known as the Blini Baron. He has also been known to make big bets on the FOREX market. Villa La Cassinella: Villa La Cassinella is located on the Punta di Lavedo. The villa is owned by billionaire entrepreneur Richard Branson. The villa is located by the water and 3 hectares of beautiful gardens filled with cypress trees. It’s area is 146 square kilometres, making it the third-largest lake in Italy. Only Lake Garda and Lake Maggiore – also located in Lombardy – cover larger areas. With a maximum debt of more than 400 metres, Lake Como is one of the deepest lakes in all of Europe. The bottom of Lake Como is over 200 metres below sea level. Lake Como is shaped like an upside-down version of the letter Y, with a northern branch that eventually splits into two branches running southwest and southeast respectively. The small but famous towns Bellagio, Menaggio and Lierna are located where the split takes place. The land between the southwestern and southeastern branch of Lake Como is called the Larian Triangle. Lake Como’s primary inflow are the rivers Adda and Mera, and the River Adda also serves as the lakes primary outflow. Adda flows out at the town Lecco in the southeastern branch branch of Lake Como. The southwestern branch has no such outflow, and is thus much more prone to flooding. Compared to Lecco, the town Como is flooded much more frequently due to its location on the shore of the southwestern branch. Villa del Balbianello was used for the casino scene in the James Bond movie Casino Royal. The Villa contains an elegant casino that you can visit and gamble in. Make sure to learn how to play before you get there. Most fellow players expect you to know how to play before you sit down at a table. You can learn how to play for free in an online casino such as LeoVegas. The Lake Como region enjoys a humid subtropical climate, but the winters can nevertheless be chilly, even though the presence of the big lake helps keep the temperatures higher than what they would be without the lake. Some of the sheltered gardens belonging to the large villas around the lake actually have tropical plants thriving in them, thanks to the stabilising effect of the lake. The coldest month is January, with an average daily temperature of less than 4 degrees C. The warmest month is July, when the average daily temperature is more than 23 degrees C.
The rainiest month is May. It sometimes snows in the region, but chiefly at higher elevations than the lake itself. If you want to visit the many small towns scattered along Lake Como’s shores, the public transit system on the lake is a great way of doing it. FerriesThe ferries run between Menaggio, Bellagio, Varenna and Cadenabbia. Some of them are large enough to carry cars. 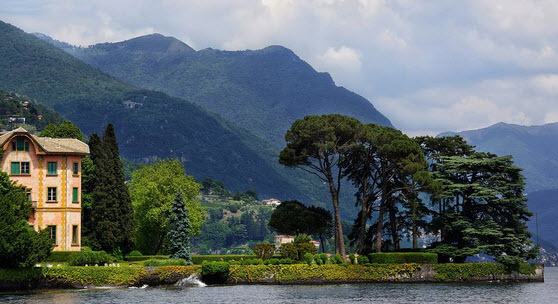 Menaggio, Bellagio and Varenna are all located in the central part of the lake. MotorshipThis service is available along the southwestern branch and northern branch of Lake Como, between Colico or Piona and the town Como. There are also some additional shuttles for the central part of the lake. Fast servicesIf you are in a hurry, you can use one of the hydrofoils. Not only are the speedy, they also make fewer stops, thus getting you from point A to point B more rapidly. On the downside, they cost more. The hydrofoils are available for more or less the same routes as the motorships.